Discovered by Philippe Loys de Chéseaux in 1746. Messier 4 (M4, NGC 6121) is one of the nearest globular clusters in the sky at an estimated distance of about 7,200 light years. Situated prominently about 1.3 degrees west of Antares, in constellation Scorpius, and being as bright as mag 5.6 visually, it can be detected by the naked eye under very dark skies, and is prominent with the slightest optical aid. Globular cluster M4 was discovered by De Chéseaux in 1745-46 and listed by him as No. 19, and included in Lacaille's catalog as Lacaille I.9. 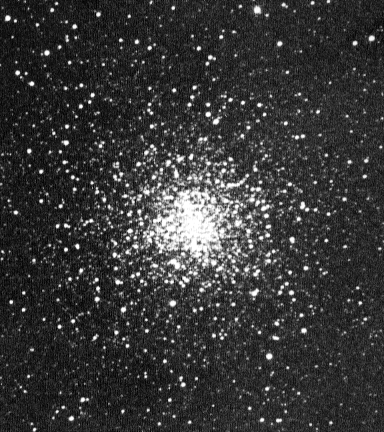 Charles Messier cataloged it on May 8, 1764 and was the first to resolve it into a "cluster of very small [faint] stars;" this is the only globular cluster he could resolve with his moderate instruments, and thus the first globular cluster ever to be resolved. Only about 20 years later, William Herschel was able to resolve all Messier globulars with his large telescopes. According to newer results (here adopted from W.E. 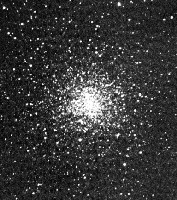 Harris' database), the distance of M4 is perhaps only about 7,200 light years, which until recently, has perhaps been the smallest for a globular; the only serious competitor was NGC 6397 in the southern constellation Ara, yet that one seems to be very slightly more remote now (7,500 light-years). This changed only with the recent (2007) discovery of faint globular cluster FSR 1767 (or 2MASS-GC04) which is estimated at only 4,900 light-years. As a remarkable detail, M4 displays a central "bar" structure, well visible in our photo, roughly from slightly below left to slightly above right; this bar of 11th mag stars is about 2 1/2 ' long in position angle 12 deg and was first noted by William Herschel in 1783. It may be that this structure caused Harlow Shapley to consider it to be elongated slightly elliptically (0.9, in position angle 115 deg), a notion which cannot be confirmed in modern observations or photographs. M4 would be one of the most splendid globulars in the sky if it were not obscured by heavy clouds of dark interstellar matter. Interstellar absorption also reddens the color of the light from the cluster, and gives it a slightly orange or brown-ish appearance on color images. Its angular diameter, seen on deep photographs, is about 36 minutes of arc, more than that of the Full Moon; this corresponds to a linear diameter of about 75 light years. On typical photos it appears somewhat smaller at about 26', and visually it was estiamted at 14 arc minutes. Its tidal radius, determined by the distance where tidal gravitational forces of the Milky Way Galaxy would cause member stars to escape, is estimated at 32.49', or about 70 light-years, so that this globular gravitationally dominates a spherical volume 140 light-years in diameter. M4 is one of the most open, or loose, globulars, as its classification in concentration class IX indicates. Its compressed central core was measured at 1.66' diameter, or linearly 3.6 light-years. Its half-mass radius is 3.65' or about 8 light-years, so half the cluster's mass is concentrated in an inner spherical volume of 16 light-years diameter. It is receding from us at 70.4 km/sec and contains at least 43 known variables. Its spectral type has been determined as F8, its color index has been measured at B-V=1.03. In 1987, the first millisecond pulsar was discovered in this globular cluster. This pulsar, 1821-24, is a neutron star rotating (and pulsating) once every 3.0 milliseconds, or over 300 times per second, which is even 10 times faster than the Crab pulsar in M1. A second millisecond pulsar was found in M28 later in the same year. In August 1995, the Hubble Space Telescope has photographed white dwarf stars in M4, which are among the oldest stars in our Milky Way Galaxy. In July 2003, investigations with the Hubble Space Telescope led to the identification of a planet orbiting one of these white dwarfs; they form a triple system with a pulsar called PSR B1620-26. This planet, of a mass 2.5 times that of Jupiter, is presumably about as old as the globular cluster M4, a figure currently estimated at about 13 billion years, or almost three times the age of our solar system. M4 can be easily found as it is only 1.3 deg west of bright Antares (Alpha Scorpii, mag 1.0, spectral type M 1.5 I, slightly variable), just south of the line to Sigma Scorpii (mag 2.9v, spec B2 III). A round diffuse patch in binoculars, it is a circular glow in small telescope, and even a 4-inch resolves the brightest stars, which are of about mag 10.8; the bar feature mentioned above is evident, and the reseolved stars appear irregularly distributed. Larger telescopes show a halo of stars around the bright central portion of the cluster to a diameter of over 16 arc minutes. Nearby (50' to the ENE) and even closer to Antares (only 30' NW), fainter globular cluster NGC 6144 (mag 10.4, 3.3' diamter) can be found; to observe it, Antares should be excluded from the field of view so that it cannot shine out that faint globular. Dust clouds and nebulae around Rho Ophiuchi near Antares and M4; material of these clouds is obscuring the cluster. Bill Arnett's Antares & Rho Ophiuchi nebula pages include M4: photo page, info page.